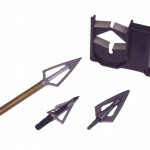 Diamond pads aligned at the precise angles allow for quick sharpening for most types broadheads. Includes a handy diamond knife and hook sharpener to create the complete sharpener. EZE-LAP Model 66, in Super Fine or Fine grit, with a sharpening guide that will work on either chisels or planer blades. 6″ x 1/4″ Diamond file on 1/4″ thick substrate. Ceramic finishing stones to give you the finest edge possible.